Time I gave some AdSense tips to increase AdSense revenue, AdSense earnings tips article updated April 2014. I own a quite a lot of web sites (around 130 domains) and most are running AdSense ads, but most of my sites (some I’ve owned for years) are not fully developed (creating content etc… takes time). I’ve recently decided to consolidate some sites, so over the next year (2014) I expect to close some domains down. Too much work managing over 100 domains, spreading content too thin. I make quite a bit of money from Google’s AdSense program and I expect earnings to increase significantly over the next 12 months as I concentrate on a smaller number of core sites (like this one): started moving content from other sites here in February 2014, (April 2014 now) and so far moved around 80 articles with over 1,000 comments and search engine rankings wise it’s beginning to pay off. Still have at least another 100 articles to move over from a handful of SEO and make money sites, one site is going to be so much easier to manage AND there’s no SEO limitations on interlinking content on the same domain: interlink say 5 domains together freely and it looks like a link farm and Google will ban a link farm! Better search engine rankings for the moved content which means more money from AdSense. Note: there are already three internal text links in the content above, I wouldn’t be able to do the above with three external links to sites I own (link farm): all three linked articles used to be on other sites. AdSense Revenue Tip: increase search engine rankings means more traffic to convert to AdSense clicks. 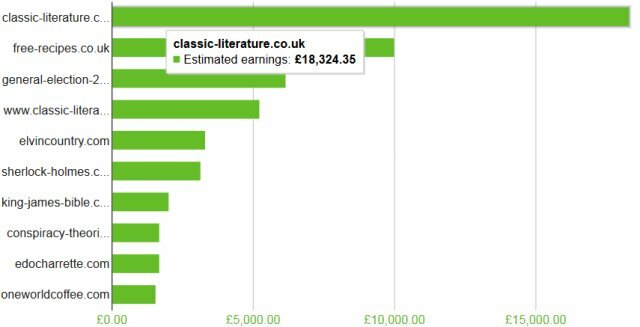 I started with AdSense end of Feb 2004 with my literature sites. I did everything WRONG because I didn’t consider AdSense revenue important. AdSense Revenue Tip: take some time to research how the AdSense program works for others. So stuck a single AdSense ad unit on the right menu at the bottom (see heat map below for why it was a mistake) and it’s no surprise AdSense revenue sucked: out of 5,000 to 10,000 impressions the sites made just over a dollar at times, my CTR was a joke!! I’d made the mistake of doing no research (which isn’t like me!) and this made me think AdSense wasn’t a money maker. That was until April 2005 (all that lost AdSense revenue :-() when I got into Amazon affiliate stores. Red means hot, white cold areas. Basically if you put the right ads in the right places of your site you are more likely to make money. AdSense Revenue Tip: the AdSense Heatmap is your friend, use it. 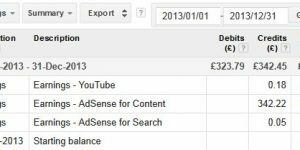 Made a significant difference to AdSense earnings in under a year. With Amazon affiliate stores you “can” generate quite a lot of new pages which years ago could generate a lot of search engine traffic quite quickly. For example one store I added to an existing site resulted in an increase of around 6,000 new visitors per day within a month! With these new Amazon sites I suddenly found my AdSense income sky rocketing over night! Note however this wasn’t a case of registering new domains and filling them with Amazon stores. I tried that as well and it didn’t work because of the sandbox effect, what made the traffic was adding the large content rich Amazon affiliate sites to existing sites that already had decent traffic/rankings. Those types of sites would see the new content index and rank quite quickly, while with new domains they languished in the sandbox for a year! This opened my eyes to AdSense revenue possibilities as with in a period of about 4 weeks daily AdSense revenue had gone from below $10 a day to over $50 a day! About three months from creating my first Amazon store (April 2005) I had my first $100 AdSense day (11th July 2005 USD101.35). By the end of that month all days were over $100, it was a great feeling to be making well over $700 a week just from AdSense and remember I also had Amazon stores that sold products, so was also making hundreds of dollars a week from their sales! Through August, September, October, November and most of December AdSense revenue was way above $100 a day, actually made from content ads (not including search revenue which I put little time to) USD17,924.97 between 1st August and 22nd December (averaged USD124.48 a day for that period) and my best day was USD192.01 on October 24th. In the same period the stores also sold almost $200,000 worth of Amazon stock which made me another $16,835.78 in affiliate revenue. So AdSense revenue took a significant dive and as I type this it’s averaging around $45 a day (down $80 from the peek) but back on the rise, which is still a very nice earner indeed. Amazon affiliate sites were awesome years ago, today if I were to add the same thin affiliate content to important sites Google would give them a ranking penalty! Because of how Google treats thin affiliate content in 2014 I barely make anything from Amazon, but it was nice while it lasted. Two things you should take from my experiences. 1st is ad placement, put your AdSense ads in the right place (see heat map) and you’ll achieve maximum revenue for your traffic, the best ad placement results in a high CTR. Basically do your research, I find a large square or rectangular ad unit at the top of the content works best (like you see on this page), others find a long horizontal ad unit in a similar location works best. 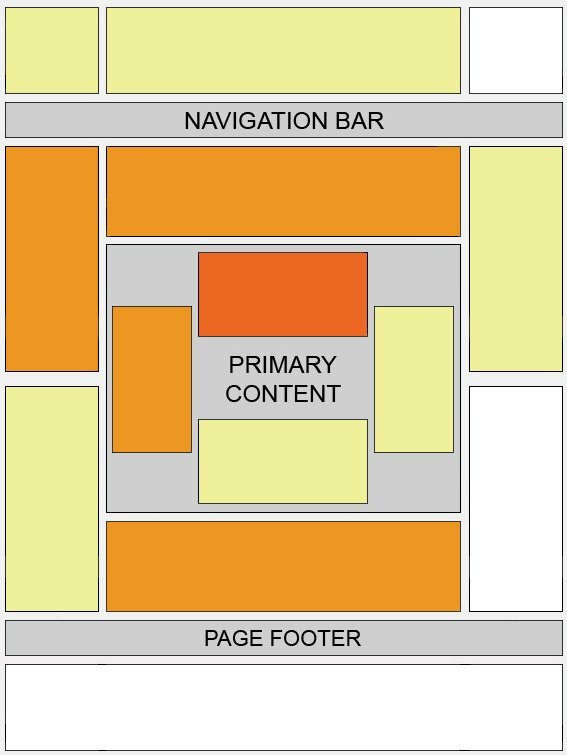 The most important factor for both is the location, you want an ad within the red/orange areas of the AdSense heat map. 2nd content is what results in traffic, to do well with AdSense you need a fair amount of traffic. 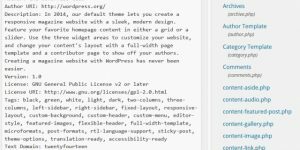 I’m always building new sites and adding as much unique content as possible. That said choose the right niche content and small amounts of traffic can generate far more income than large amounts of traffic. For example I mentioned about one Amazon store adding 6,000 new visitors per day to a site, this was Poetry related traffic and I found that traffic did not convert well to AdSense clicks. That section went live Sept 04 2005. On the 14th Sept it was seeing over 2,000 visitors a day and by the 4th October over 6,000 a day. It stayed that way until November 6th (Google filtered it then). From October 4th to November 6th the section had almost ~200,000 visitors and made just USD257.95 ($7.59 a day). I’m not complaining at making $250 in a month from a store that took an hour or two to make, but the traffic sucked, low click thru rate, low eCPM all that made up for it was the sheer amount of traffic! Poetry is not a niche that will make a lot of money unless you have a LOT of content like an Amazon store script that creates thousands of poetry book pages for sale and this results in a lots of traffic. If I compare the same period of time for a store selling kitchen appliances I find the kitchen store traffic visitor for visitor is much better. Same period of time, 40,000 visitors (a 5th as many) made USD424.79 ($12.49 a day $5 more a day!). So if you are creating new sites for AdSense rather than using AdSense on your existing sites do the research, find the right niche that will bring good traffic that converts well. AdSense Revenue Tip: the most important AdSense tip of them all DO NOT CLICK YOUR OWN ADSENSE ADS, it will only be a matter of time before Google AdSense bans you from the AdSense program. 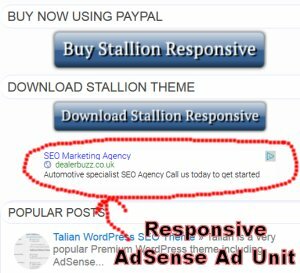 Google AdSense has introduced AdSense Responsive Ad Units which basically resize for different screen sizes. The WordPress theme I develop is AdSense Responsive, you can see the AdSense responsive ads in action by either reducing the size of your browser window (on a Desktop PC) or viewing this site in a mobile phone or tablet device. You will see the ads change size Dependant on screen width, the image floating to the right is what the AdSense Ad unit you see on the left sidebar of this site (large rectangular ad on a Desktop PC) looks like on a mobile device, much smaller ad unit. This not only improves user experience (more ad clicks from mobile devices), but improves search engine rankings since Google is taking this sort of thing into account in it’s ranking algorithm. I know this has been rehashed before but with stallion 7.0 it is a good opportunity to experiment. I see you are now a 2 column webmaster. Did you do this to increase time on site or adsense? I am curious if anyone else has done testing. Been meaning to test the effectiveness of the different layouts on AdSense ad revenue, but my current decision is based on what I like.